Staples: I sent a private email to a friend to warn her of Bob Sungenis’ whackiness” that was not intended to become public information. I am not going to enter into a lengthy argument with you about this. I have gone down that road before with Mr. Sungenis and I have made the judgment that it is not worth the time. But now that I have been threatened with some untold “consequences” for my actions, and I have been accused of “slander” by Mr. Sungenis, I will spell out for you SOME of the reasons why I said what I said to my friend. Sungenis: The real problem, in my opinion, is that Catholic Answers (for whom Tim works) has chosen to take the politically correct road in their treatment of this issue. Karl Keating was sent my Galileo Was Wrong books, but as far as I know, he still hasn’t read them and has never interacted with any of the arguments presented in them. Instead, Karl keeps repeating the same elementary viewpoints he has used in the past, but which have all been scientifically disqualified. Where Did the Term "Sola Ecclesia" Come From? 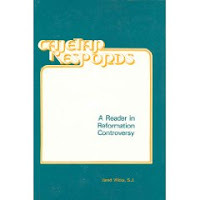 A few weeks back I mentioned my recent acquisition: Jared Wicks tr., Cajetan Responds: A Reader in Reformation Controversy (Washington: The Catholic University Press of America, 1978). A contemporary of Luther, Cajetan was a leading Roman Catholic scholar and deeply affiliated with the Papacy. I usually mention Cajetan because of his views on the canon of Sacred Scripture. Cajetan's opinions are interesting to juxtapose against Luther's. Romanists typically malign Luther mercilessly on the canon. For instance, on a discussion thread I'm involved with, it was stated, "Luther was a Catholic who denigrated Scripture, removed 7 Books from the Old Testament as he saw fit, and attempted to do the same with Revelation, James, Jude and Hebrews. He tampered with Scripture to boost his new doctrines..." This is a typical caricature. A person stating something like the above typically has no idea how to navigate their way through Cajetan's view on the canon. Recall some of the charges against Luther: he questioned (or denied) the canonicty of James, Jude, Hebrews, and Revelation. He saw these books as not the works of apostles, but of second century Christians. He also classified the Old Testament Apocrypha as: not held equal to the Scriptures, but are useful and good to read. The dilemma is obvious: how can Luther be chastised for being the sixteenth century Marcion, while Cajetan held very similar views, and was a leading Roman Catholic scholar? Cajetan's biblical commentaries occasioned no little admiratio. From Luther, there is a recorded remark, "Cajetan, in his later days, has become Lutheran." Considerable zeal was expended by Ambrosius Catharinus, O.P., against the exegetical work of his retired Master General. Catharinus submitted a denunciation before the still acerbic faculty in Paris and proceedings began that could have led to another book-burning Clement VII intervened in a letter to the Parisian professors in September, 1533, to protect the man who was by then the Pope's regular source of valued theological advice. Proceedings were halted at this time in Paris, but not before an open letter of the Parisian theologians had begun to circulate listing the censurable propositions excerpted from the commentaries. The Sorbonne masters charged Cajetan with imprudently taking these notions from Erasmus or even Luther. The letter ended with a stinging rebuke of Cajetan's rashness in abandoning the long approved Vulgate text to base his work on new versions in no way guaranteed for their exactness. In 1534 a Wittenberg printer, no doubt with considerable glee over this discomfiture of Luther's old adversary, brought out the open letter in pamphlet form. Catharinus published his criticisms of Cajetan's commentaries in 1535, revised and expanded them in 1542, and obtained a censure by the Paris faculty against Cajetan's biblical works in August, 1544. The specific charges brought against Cajetan concerned the reservations and plain doubts he had expressed about the apostolic origin of the final eleven verses of Mark's gospel, the story of the adultress in John 8, and five whole epistles of the New Testament (Hebrews, James, Jude, and 1 and 2 John). These views were especially serious in Cajetan's case, since he had laid down the rule that apostolic authorship or direct approval by an apostle was normative for inclusion in the New Testament canon. Following Jerome, Cajetan also relegated the deuterocanonical books of the Old Testament to a secondary place where they could serve piety but not the teaching of revealed doctrine. Certainly Cajetan's commentaries deserved better treatment than they received at the hands of the fearful Catharinus and the censorious Parisian faculty. Cajetan's confident approach to the biblical text did not fit into the mentality of cautious defensiveness that began to predominate in the Catholic world less than a decade after his death. From our vantage point, it may well be that the most significant results of Cajetan's dedicated work on Scripture are to be found in the concise treatises he wrote in the final four years of his life. I found this very interesting because I didn't realize Cajetan's views did cause some controversy, at least with one man. So what does this information do to the Luther / Cajetan comparison? First it shows us that someone close to the papacy was able to express similar ideas as Luther and be protected by the papacy. And why not? Cajetan, and Luther had every right within the Roman Catholic system to engage in Biblical criticism and debate over the extent of the Canon before an offical declaration by a council. Second, It appears to me, the quest for ad fontes sources was a major impetus provoking the textual and historical criticism of sixteenth century scholars, both on the Roman Catholic and Protestant side. Other documents besides Scripture were being looked over as well. Forgeries of the Early Church Father's were uncovered. Wicks points out that Cajetan's criticism of the Vulgate drew heated response as well. The tradition of the Vulgate appears to have clouded many minds. Third, the problem of bias still stands. How is it not a double standard for contemporary Romanists to chastise Luther's New Testament criticism, while completely ignoring Cajetan (or Erasmus as well)? Why is it the man protected by Clement VII gets a pass? Following St. Jerome, the Cardinal finds great difficulty in assigning the Epistle of St. James to the " brother of the Lord " its opening salutation which differs so greatly from the ordinary apostolic formula playing in his mind a preliminary obstacle to its apostolic origin. The violent abuse which the Roman advocates have heaped upon Luther for entertaining the same doubt stands in strange contrast with the fact that Cajetan s views on the doubtfulness of this and many other parts of the canon have never given him a place in the " Index," or even detracted from his general authority as a divine. The salutation appears to him so brief and secular as to present no point of affinity to those of the other apostles. The Second Epistle of Peter he held to be of very doubtful authenticity, but considers that St. Jerome's scepticism regarding it, on account of its difference of style from that of the former, would tell against either epistle with equal force. For either might represent St. Peter s style, and two of the Catholic Epistles claim to be his. But difference of style he regards as not a sufficient criterion, as many writings of the same author (as the Registrum of Gregory the Great and his other works) present equal differences. Yet (and this is not a little remarkable) the writings of Cajetan, notwithstanding the freedom with which he rejects the Apocrypha, and claims a "liberty of prophesying" such as the Roman Church has never admitted in its greatest saints, have never been placed in the Index, though the bitter attack of Catharinus, himself a member of the Council of Trent, and of great influence in Rome, might have well secured for them a place in that Walhalla of sacred and profane literature. The writings of Cajetan, however, needed not this posthumous advertisement. Nay, he has a yet more illustrious one in the great work of Pope Benedict XIV., " De Synodo Dicecesana " (1. xiii. c. xix. sect, xxviii. ), where he is bravely defended by the Pope against Catharinus. "Catharinum excessisse in censura, tum quia non fideliter Cajetani sententiam retulerit, tum quia non admodum solide eam impugnaverit, facillime ostenditur." 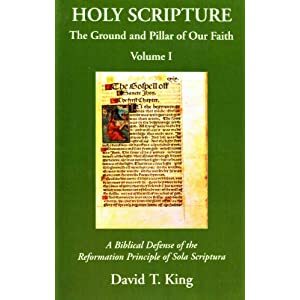 2 - Sola Scriptura: What does Scripture say? 7 - The Papacy: Papal Primacy - Fact or Fiction? I didn't know that, or if I did at one time, I've since forgotten it. Interesting tidbit: Every reference I've checked so far indicates Luther treated the long ending as Sacred Scripture. A contemporary Luther's, the great Roman Catholic theologian Cardinal Cajetan,doubted the authenticity of Mk 16:9-20. And then shall every word also seem consistent to him, if he for his part diligently read the Scriptures in company with those who are presbyters in the Church, among whom is the apostolic doctrine, as I have pointed out. DA, by quoting only this last sentence of Irenaeus' section, is trying to make Irenaeus sound like a Roman Catholic; although in "seed" form (binding authority, apostolic succession) whereas if one reads the context of the whole section, both before and after, we find that what Irenaeus is saying is consistent with what any doctrinally sound Reformed Protestant would say today. 1. After this fashion also did a presbyter, a disciple of the apostles, reason with respect to the two testaments, proving that both were truly from one and the same God. For [he maintained] that there was no other God besides Him who made and fashioned us, and that the discourse of those men has no foundation who affirm that this world of ours was made either by angels, or by any other power whatsoever, or by another God. For if a man be once moved away from the Creator of all things, and if he grant that this creation to which we belong was formed by any other or through any other [than the one God], he must of necessity fall into much inconsistency, and many contradictions of this sort; to which he will [be able to] furnish no explanations which can be regarded as either probable or true. And, for this reason, those who introduce other doctrines conceal from us the opinion which they themselves hold respecting God, because they are aware of the untenable and absurd nature of their doctrine, and are afraid lest, should they be vanquished, they should have some difficulty in making good their escape. But if any one believes in [only] one God, who also made all things by the Word, as Moses likewise says, “God said, Let there be light: and there was light;” (Genesis 1:3) and as we read in the Gospel, “All things were made by Him; and without Him was nothing made;” ( John 1:3) and the Apostle Paul [says] in like manner, “There is one Lord, one faith, one baptism, one God and Father, who is above all, and through all, and in us all” ( Ephesians 4:5-6) this man will first of all “hold the head, from which the whole body is compacted and bound together, and, through means of every joint according to the measure of the ministration of each several part, maketh increase of the body to the edification of itself in love.” ( a combination of Ephesians 4:16 and Colossians 2:19) ,And then shall every word also seem consistent to him, if he for his part diligently read the Scriptures in company with those who are presbyters in the Church, among whom is the apostolic doctrine, as I have pointed out. 2. For all the apostles taught that there were indeed two testaments among the two peoples; but that it was one and the same God who appointed both for the advantage of those men who were to believe in God, I have proved in the third book from the very teaching of the apostles; and that the first testament was not given without reason, or to no purpose, or in an accidental sort of manner; but that it subdued those to whom it was given to the service of God, for their benefit (for God needs no service from men), and exhibited a type of heavenly things, inasmuch as man was not yet able to see the things of God through means of immediate vision; and foreshadowed the images of those things which [now actually] exist in the Church, in order that our faith might be firmly established; and contained a prophecy of things to come, in order that man might learn that God has foreknowledge of all things." So, at first glance, the last sentence by itself that he quotes is made to look like some kind of Roman Catholic doctrine of a "seed" that will develop into the infallibility of the church leaders and then the Bishop of Rome and then centuries and almost two millennia later, in 1870, finally be revealed for the people of God for guidance and knowing the right interpretations and solving all problems of disunity with the supposed ability to walk into the room and say "Thus says the Lord". Irenaeus is fighting Gnosticism, and the various forms of it; Valentinian, Basiledes, and Marcion ( and others also). Gnosticism was not monolithic. Protestants disagree vehemently with Gnosticism; so most of the points that RCs try to score in debate by using Irenaeus and Tertullian and others are anachronistic with the way they are trying to make them be anti-Protestantism. We are not claiming that the early church was Protestant, only that they are what they are, the early church, and that they are not Roman Catholic. As Dr. White says all the time, "let the early church be the early church". 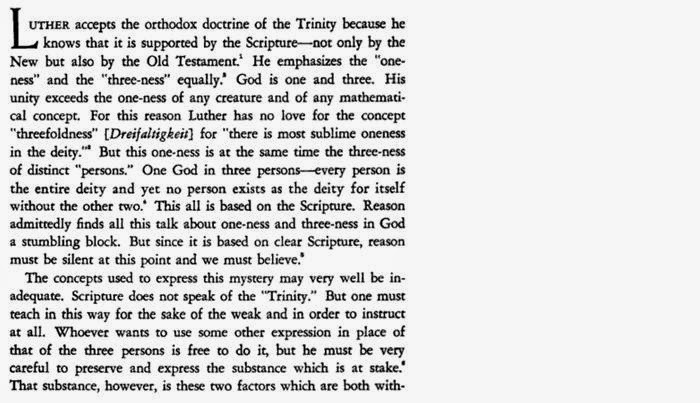 Every time Irenaeus spells out the content of the "rule of faith", it is a doctrinal summary in simple form of the main doctrines of the ecumenical creeds of the first 5 centuries. (see Against Heresies, 1:10:1-2 and 3:4:2) Protestants agree with this. There are no Roman Catholic distinctives or "seeds" to develop ( in a Biblical or legitimate exegetical way) later in these doctrinal summaries or creeds. To claim that is anachronistic and not dealing with history fairly. The Roman Catholic "developments" later in history are exaggerations, distortions, mutations, deformities, corruptions. 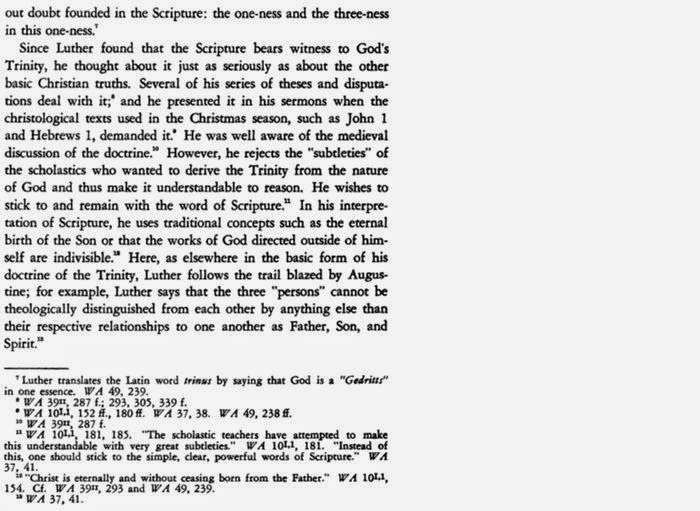 Irenaeus shows at the beginning of his section here, that a presbyter learned the apostles doctrine that is in Scripture, that the OT is inspired Scripture and the God of the OT is the same God in the NT and so he is refuting the idea of the Gnostics of an evil god (a demiurge) in the OT who created matter (and the Gnostics claim that matter is evil); and refuting the Gnostic idea that the Father of the Lord Jesus Christ is a different good God from the OT "god". Protestants agree with this. We believe in church leaders/presbyters (elders)/pastor-teachers/overseers (Acts 14:23; Titus 1:5ff; I Timothy 3; Acts 20:17, 28; I Peter 5:1-5) Irenaeus is saying the same thing we do; one must read the Scriptures and read the Scriptures with the presbyters. But Irenaeus also says that the Presbyters follow the Scriptures as their final authority, because the apostles doctrine was written down, and he just quotes from the writings to prove his point. Irenaeus goes on to quote Scripture proving his point, so no where is he talking about Roman Catholic distinctives or dogmas here. Since the presbyter was taught from an apostle, and the content of that teaching was Scripture, as Irenaeus shows by extensive quoting from it; and the interpretation of the Presbyters is the same all throughout the churches that the OT is inspired Scripture and the God of the OT is the Father of our Lord Jesus Christ, the last statement is only saying that the average Christian, when he reads the Scriptures, will find that the Scriptures are clear and he will be build up in the faith and grow, as Ephesians 4 teaches, as he reads the Scriptures with the Presbyters (Elders) of the church at that time, that were interpreting the Scriptures rightly, that there is only one good Creator God, Sovereign, all mighty and who is the same, the Father of the Lord Jesus Christ. There is no promise that future presbyters will be infallible. If in the future, they do not follow Scripture, then they have no authority. So, these kinds of methods are all throughout DA's kind of argumentation, and it is not necessary, as he keeps claiming and whining about, that everyone must deal with every word that he has written and cut and pasted or else he will not deal with their arguments at all. I hope Jason Engwer keeps it up and stays in the battle and responds fully to all of the significant issues; even though DA requires someone to respond to every word, it seems. All we have to do is to shoot holes in some of his argumentation, as we have time, which we have done (Jason Engwer, Steve Hayes, Turretinfan, and simple me) (DA has not answered the points I made in my earlier article concerning how he misread Philip Schaff and Ireneaus on the barbarian tribes who had the basic gospel before the Scriptures were translated) and DA refused to deal with Turretinfan's excellent critiquehere and the whole Roman Catholic claims of infallible authority are exposed as false and not Biblical nor existent in early church history, then the whole edifice of the Papacy and infallibility crashes to the ground. Furthermore, the very nature of their definition of 1870 shows that if they made one mistake, the whole thing is false, because one mistake means they are not infallible. Since they have made many mistakes both doctrinally (and morally), they are not infallible. And this shows that David Waltz was right to leave the Roman Catholic church. I'm sure most everyone stopping by here ventures over to Triablogue, but in case you don't, Steve Hays has an excellent post entitled, Is sola Scriptura self-refuting? I'm assuming many of you are familiar with Libronix and Logos software. I've been using it for almost 10 years now. It's a digital library, I probably have a few hundred books on it. The texts are searchable. I have second ten year old computer I keep off to the side of my desk. Usually I have something running on it, like Libronix. It's helpful sometimes when I'm working on something to use two computers. Well the old system had to be wiped clean and then have the programs reinstalled, which isn't a big deal. Today, I reinstalled Libronix. The first term I searched for across a few specific books was the word "Mary." Now, it doesn't care what term I put in the search engine. It will only return results for the word Mary. Is this simply a software blip, or is there a greater meaning? Moses is an executioner, a cruel lictor, a torturer who tears our flesh out with pincers . . Whoever, in the name of Christ, terrifies and troubles consciences, is not the messenger of Christ, but of the devil . . Let us send Moses packing and forever. So far, I've only found this quote being used one other place: the Romanist propaganda page entitled, "Luther Exposing the Myth". I've interacted with this web page before, though never the author directly: Raymond Taouk. I wrote the host web page a few years ago and let them know I critiqued some of Mr. Taouk's research, and they told me they forwarded that on to him. I never received any response from him. 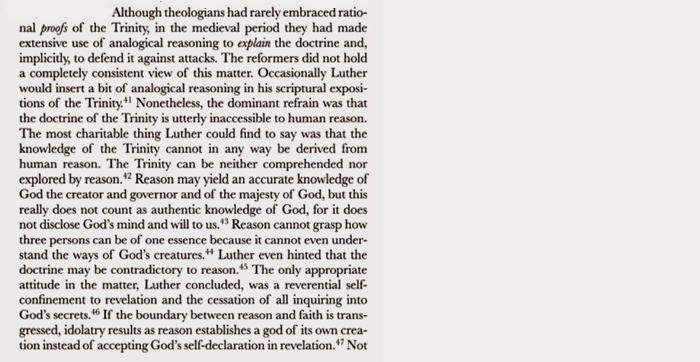 "Luther Exposing the Myth" is a popular web page utilized by zealous Romanists. Taouk documents the quote as D. Martini Lutheri Exegetica Opera Latina, published by Elsperger (Erlangen, Heyder, 1829-84), Vol. 18 pg. 146. I doubt Mr. Taouk actually utilized this Latin text. I was not though, able to determine exactly which secondary source Taouk used. This is the first sweet and delightful thing in this lyric, which sings about and promises a kingdom with such a King. There will be no imperfections in Him, but a will full of virtues and a mind full of wisdom, with glowing love toward all miserable, damned, and sorrowful sinners. Moses is not such a king. He is a tormentor and cruel executioner and torturer, who torments us and troubles us with his terrors, threatenings, and displays of wrath. He forces us to do good outwardly; or, if we do our best, he inwardly humbles us and makes us long for grace. But our King, who is celebrated here, is full of mercy, grace, and truth. In Him love for mankind is to be found and the greatest sweetness; a person who, as we find in Isaiah 42:2, “does not cry in the streets,” is not austere and rough, but patient and long-suffering. He exercises judgment against the wicked and blasphemers, and shows mercy toward sinners. Therefore He is a most pleasant and fair King, and there is no one like Him in the whole world. In Him is to be found the highest virtue and the highest love toward God and men. It is with these adornments that His person is decorated, so that there is no overweening pride, desire, lust, or any other base affection in Him. We see Him described this way in the Gospels, and the facts themselves point to His having been so. He did not keep company with the holy, powerful, and wise, but with despicable and miserable sinners, with those ruined by misfortune, with men weighed down by painful and incurable diseases; these He healed, comforted, raised up, helped. And at last He even died for sinners. He did not frighten, and He did not kill, as Moses did, but He drew, gladdened, comforted, cured, and aided all who came to Him. He is therefore the King of kings, without equal. Yet this is true only if you look at the spirit and not at the external appearance of the flesh. This is simply one aspect of the description of His person, pointed out briefly and with few words. The holy Evangelists and St. Paul in his Epistles describe it more fully and enlarge upon it; they paint this King in His true colors and point out what kind of person He is, and these things are most helpful for those of us who find ourselves in difficulties and vexations of conscience. So Christ should not be depicted with gall or a sword in His mouth, as they always portray Him, unless it is to be understood spiritually. He should be depicted in such a way that His lips seem to be pure sugar or honey. Whoever depicts His mouth otherwise errs, and we should rather listen to this poet than to the papists and Satan, the authors of this horrible picture. For this poet will not deceive us when he ascribes to Christ the loveliest mouth. This must be noted carefully. For Christ should not make hearts sad with His words, He ought not to terrify. Whoever terrifies and vexes consciences in Christ's name is not a messenger of Christ but of the devil, for Christ's name is: "A bruised reed He will not break, and a dimly burning wick He will not quench." He is gentle: "He will not cry or lift up His voice or make it heard in the street" (Is. 42:3, 2). He is not rough, severe, biting like Moses, who looks like the very devil and speaks in a way that our heart almost vanishes before him. For he has lips overflowing with gall and wrath, that have been embittered with laurel and gall, in fact, with hellish fire. So away forever with Moses! But our King has pleasant lips; that is, His Word is the Word of the remission of sins and of comfort for the lowly, the Word of life and salvation to recall the damned and dying. Darlene in the combox asked some good questions about Islam that are very common in these days. I decided this would be good for a separate post. Do you think the Muslims worship the same God as Christians - that is, YHWH? I've been commenting over on Seth's blog and he seems to think so. Thank you for you good questions! Many people have these same questions. The short answer is no; the god of Islam is not the one true God of the Bible, who is a Tri-une (Latin: Tri – Unitas = “three in one”) God. Doctrinally, Islam rejects the Trinity and the Deity of Christ, so the doctrine of who Allah is in Islam is not the God of the Bible. They do not worship the same God because they don’t have the one mediator (I Timothy 2:5; John 14:6; Acts 4:12), Jesus the Messiah, the word of God from all eternity who became flesh. (John 1:1, 1:14) Allah is a monad, all alone; and Muslims are actually taught not to think too deeply about Allah. Allah cannot technically be called “He”, because “he” is a pronoun for a man, boys, males. One of my Turkish neighbors told me, “Don’t say “he” for Allah; Allah is “it” !” Allah is impersonal also. Allah is more like a mysterious force. The goal in Islam is not to know God personally nor have a personal relationship of trust with Him; but rather the goal in Islam for the individual to just to obey Allah; obey His laws. The relationship in Christianity emphasizes that we are “sons of God”, God is our Father; whereas in Islam the emphasis is on Master to slave. The common Muslim name, “Abdullah” means “the slave of Allah”. Islam does not have anything like we have in the Bible in John 17:3 - "this is eternal life, that they may know You, the only true God, and Jesus Christ whom You have sent." Knowing God in an close, living, spiritual relationship is foreign to the Islamic system. However, Muslims are referring to the same concept (same referent) as the one Sovereign, Invisible creator of all things, who revealed Himself through prophets and books. (Monotheism with basis on the previous Scriptures, the Torah and the Gospel) They are claiming to worship the God of the Bible; but in reality they are not. They think they are worshiping the one true creator God, but they are not. The Roman Catholic Catechism that says “the Muslims . . . together with us they adore the one, merciful God"; is wrong. (Catechism, # 841) They think they do because it is monotheism and has revelation and books, but without the Incarnation and the redemption of the atonement and resurrection, they cannot know God. They do not adore the God of Bible, because they cannot approach Him, nor come to know Him and His holiness without faith in Jesus Christ as the one mediator and Savior and Lord; God in the flesh. So doctrinally, the god of Islam is not the God of the Bible. However, linguistically, there is nothing wrong with the phonetic sounds, “Allah” in missionary contexts and cultures that have that word as the best word for the one true creator God. In Arabic, that is the best word for the Hebrew Elohim in the OT and for Theos in the New Testament. In other Islamic cultures, “Allah” is still the best word for their heart languages. However, in Farsi/Persian, the language of Iran, Allah is not the best word. The word for God in Farsi/Persian is “Khoda”. That is a matter of language and translation. Godly and doctrinal missionaries will work hard to teach the Deity of Christ and the Trinity so that the new believers in Christ who come from an Islamic background will truly understand and worship the God of the Bible. So, for Arabs, we would use “Allah” when speaking of God; no problem. But as we make disciples and teach and preach the gospel, we must fill in the proper doctrinal content of who Allah really is. YHWH is the Hebrew word for the covenant keeping God of Israel in the Old Testament, derived from the first person “I am that I am” (Exodus 3:14). In most English translations we have translated it, “LORD” with capitals to distinguish it from “Adonai” (Lord, boss, master). Christian cultures in the Arabic speaking world use the word “Rabb” for this word (YHWH/Adonai), which means, “lord”, “boss”, “master”. The Roman Catholics, Armenians, Eastern Orthodox, and Protestants in the middle East who speak Arabic all use “Allah” because it is their language, and that is the best word in their language for Elohim in the OT and Theos in the NT. Bibles in Arabic, and other Muslim languages use Allah for Elohim and Theos. But not Iranians, they have their own language and word. The Turks have their own Turkish word for God, "Tanri", but the traditional Muslims in Turkey want to keep "Allah". Tanri is mostly used by the modern more secular Turks. Also, do you think that Islam is a violent religion or that only the few extreme Muslim terrorists can be placed in that category. Iow, are the majority of Muslims in the world peaceful? Your “or” in your sentence here has confused the categories. Islam is the religion/doctrine/political system whereas Muslims are people. Islam teaches violence, but most Muslims are not terrorists or "Jihadists" in the sense of wanting to take over the world by force and use tactics like suicide bombings. But, if there are over 1 billion Muslims in the world today, and, say, 10-20 % believe in Jihad to spread Islam, then that is a lot of people! Most Muslims would believe that true Jihad is supposed to be "self-defense" or "just war". One of the problems with answering this question is that Muslims will take offense and take it personally. So it is important, I think to clearly distinguish between the political-religious-social system of Islam vs. the people, who call themselves Muslims. The Muslims went on to conquer other areas in Asia and spread Islam to Central Asia (Turkestan: Kazakhstan, Uzbekistan, Kirgizstan, Turkmenistan), the rest of the Persian Empire, Afghanistan and Tajikistan, India (today Pakistan and N. India are the results of Islam’s inroads into India), China (western China has over 60 Million Muslims! ), Malaysia, and Indonesia. In the Middle East, it was only after the Ottoman Empire was defeated at the end of World War I (1917) and the Khalifate was abolished (1922-1924) and the “Ummah” was split into separate countries that created more secular Muslim countries and the ability for many Muslims to separate doctrinal-Jihadistic Islam from their religious/spiritual duties. The most consistent expressions of doctrinal and original Islam today are Saudi Arabia, and the Taliban areas of Afghanistan and Pakistan for the Sunnis and Iran for the Shiites – they are all three what the west would call a “theocracy”, because they are consistent in actually applying Islamic political and social law in daily life. So, yes, Islam teaches fighting and killing (qatl, qatal), war (harb), and jihad (struggle, effort). It is a violent religion in its original doctrines and teachings in its scriptures, the Qur’an, and the Ahadith ( plural of Hadith, “written traditions of Muhammad”). The modern Muslim in the west would object and may say that the goal was only to unify Arabia and that those verses do not apply to today. The problem with that is that there is no text in the Qur'an or Hadith that shows that the Jihad/Qatal/harb is supposed to stop. But Muslims themselves are not all terrorists and many Muslims are peaceful and hospitable people. They can be very friendly and respectful and family oriented; and learning their culture and hospitality and talking to them about spiritual things is always interesting and fun and challenging. They are human beings, created in the image of God, in need of the Savior Jesus Christ. They are sinners, and we are sinners. We are not better than them. Those of us whom God has saved by His grace want to share the gospel with them. Many Muslims don’t know their own religion. Most Muslims see Jihad as self-defense or equivalent to the Christian view of a “just war”. If a western country attacks a Muslim country or if the Hindus in India attack the Muslim areas, or the Atheists/communist Russian try to take Afghanistan, the whole Muslim communities are galvanized to do Jihad, struggling and fighting for Islam. Today, the Muslim world is going through a real crisis of identity and struggle within itself to see if they are going to follow Muhammad’s Islam or a more moderate expression of Islam that it seems most Muslims would desire. The Jihadists movements of terrorism, such as Al Qaideh, are movements of consistently applying all of the texts of Islam globally with the desire to re-establish the Khalifate. (In Sunni Islam, succession to Muhammad as one leader over all the Muslim world.) The problem is that the Shiites do not believe in the Khalifate, they have what they call the Imamate ( Two schools of Shiites: 12 Imams, or 7 Imams = descendants of the family of Muhammad. So there is great disunity in the Muslim world over these issues. Is the understanding among most Muslims that Islam's goal is to be a theocracy in all countries that they occupy? Hard to know what most Muslims understand deep down vs. what they are willing to express in public in western countries. The Muslim world was humiliated by the defeat of the Ottoman Empire and the establish of the state of Israel in 1948, and the colonial powers drawing borders and training secular leaders in the last almost 100 years. This humiliation and defeat became the seed bed of thinkers like Hassan Al Banna, the founder of the Muslim Brotherhood, who influenced Saeed Qutb in Egypt, who inspired Usama Ben Laden and Ayman Al Zawahiri. Most Muslims probably did not think deeply about this issue since the breakup of the Ottoman Empire (1922-1924) until recently. But yes, a political state of Islam (a "theocracy") was the original intention and goal and it is obvious from reading the Muslim sources and Islamic history. The disunity with the Shiites and the European self-defense stopped this in history. The recent history of the Jihadists movements is actually forcing more and more Muslims to think about this issue more and more. If so, was this Muhammad's goal? Yes, read his words in the article I gave you. See again Surah 8:39; 9:29. As of late, I've had an increasing interest in Islam. I think it started when I attended a presentation at St. Tikhon's Seminary by an Orthodox priest from Indonesia, who had been raised in the Muslim faith. He knew the Quran quite well and quoted from it extensively. He spoke of the harsh treatment Christians receive (whether Orthodox or Protestant) in that country, since the majority religion is Islam. Very interesting! Yes, Christians are treated harshly and are second class citizens in Muslim countries. They are called “dhimmis”. It means the “protected peoples” of the “people of the book” ( Christians and Jews). They must pay the "jaziye" ( a tax on them to show their submission to the Islamic state. Dhimmis cannot share their faith with Muslims or build new churches. So I thought I'd make some inquiries from you since it seems you have a fairly good grasp (and interest) of the subject. Darlene, Thanks for your questions and gracious compliments! I recently came across what I would call a sedevacantist website, but maybe that isn't the most accurate term. As best I can tell, this website details the great conspiracy many years ago to hide the truly elected pope and replace him with an antipope. The site is called The Pope in Red and while I do enjoy the conspiracy theory types, I was most struck by the terrible design of the site. The page is littered with text and pictures and it is difficult to understand what is actually being alleged without some digging and conjecture. So I was amused to come across a second site a few days later which boasted a similar bad webdesign by another sedevacantist type. For a few minutes I thought I had stumbled upon some great correlation: RC conspiratists have very poor web design skills. What could be the connection? But lo and behold when I checked the bottom of the site I noticed the two sites were from the same group/author. In fact, the logo for the sites all link back to this site which offers a few more websites to peruse. My favorite part is this page. Not only does this person believe freemasons overtook the papacy, but they also were involved with 9/11. Of course, anyone who buys into any of the 9/11 conspiracies is a kook in my opinion, but the freemason stuff isn't as out there as some might think. When I went to see Gerry Matatics he also believed that freemasons had infiltrated the Vatican yet I wouldn't consider Gerry a kook. Wrong, but not a kook. But it's all entertaining in my book. “So why did Allah substitute an innocent ram (or sheep or lamb) to be killed instead of Ibrahim’s son?" In the photo,(a post card from Turkey) you can see Ibrahim (Abraham) (pictures of a prophet drawn by Muslims! ), Ismail, the angel Jabril (Gabriel), and the substitutionary ram; and verses from the Qur'an in Arabic, including Surah 37:107 (see below) and a phrase in the Turkish language, "The Prophet (Hz. = "Hazrat" - a term of respect for prophets) Ibrahim offers his son Ismail as a human sacrifice". Shabir Ally says (as all Muslims also do), that God does not need a sacrifice to forgive sins. He also said that there is a great difference between “ransom” and “sacrifice”; and that the concept of the substitutionary nature of Christ paying for the sins of others is unjust. Shabir Ally said, “there is a difference between sacrifice and ransom; they are two different things, . . . until Anselm”. He also referred to some of the early church ideas of “ransom to Satan”, which is not Biblical at all; and he seemed to imply that "ransom" in Mark 10:45 was the "payment to Satan view". We are not going to deal with the question of which of Abraham’s sons this was, except to affirm the Bible’s testimony that it was Isaac (Genesis 22:1-18); and to point out that most Muslims have traditionally held that it was Ishmael, although the text of the Qur’an does not say this specifically. When a Muslim is pressed from Hadith and commentaries and the Sira literature, it looks like there is more evidence that it was actually Isaac. See here. It is interesting that only Isaac is mentioned by name in this context. (Surah 37:112-113) There are some Muslims who admit that it is not dogmatic and that one can believe it was Isaac, that Muslims are free to follow either of the two interpretations. You can go to www.answering-islam.org and do searches there to find lots of information on that issue. I think it is better to focus on the issue of substitutionary atonement and the meaning of the gospel before arguing over which son it was. My focus in this article is on the substitutionary nature of the sacrifice of the Messiah; and that the story of Abraham and Allah’s command to sacrifice his son, and the ram who was substituted is in the Qur’an and actually shows some basic understanding of the truth of the concepts of sacrifice and ransom. In this verse, 107 of Surah 37 (Al Saffat, “Those who set the ranks”), both words are used there together of the substitute, ransom (fedieh - فدیه) and sacrifice ذبح – zebh ); this word is also used a few verses earlier in verse 102, “Oh my son! I have seen in a dream that I offer you in sacrifice.”). We have both of these Arabic words in Farsi (or Persian) also. So, Shabir Ally should have understood this, that God has spoken of both ransom/redemption and sacrifice in the Old Testament, the “Taurat- e- Mosa” (the Law of Moses) and the Qur’an affirms it here. Christians believe that the substitute points to the Messiah to come and was a prophesy of the Messiah and His substitutionary atonement. You may have even heard of the “fadayeen” (those who sacrifice themselves) in the news, they are those who volunteer to fight against the enemy. So there is a sense in which Islamic culture and history should understand Jesus the Messiah’s death as a voluntary sacrifice for others. Another word, “qorban” (قربان) is related to the Hebrew/Aramaic term “Corban”. (mentioned in Mark 7:11; the Hebrew is in Leviticus 1:2 twice, and other places.) When Iranians greet one another, we say, “Ghorban-e-shoma!” قربان شما (“I am your sacrifice or ransom!” – a term of devotion and love and friendship.) When the Arabs converted the Iranians (the Persians) to Islam, it took them about 300 years, but a lot of Arabic came into their language so that, today, Farsi is about 40% Arabic. “The Son of man did not come to be served, but to serve and to give His life a ransom (فدیه، فدا) for many.” The Farsi versions of this verse have the same root concept of this word, "fada"فدا , from "fedieh" فدیه . John 10:17-18 – Jesus voluntarily laid His life down. For this reason the Father loves Me, because I lay down My life so that I may take it again. No one has taken it away from Me, but I lay it down on My own initiative I have authority to lay it down, and I have authority to take it up again. This commandment I received from My Father." This word for deceiver, (Makara, from "makr" = deception) is not translated correctly by most English translations of the Qur'an. It is usually translated as "plotting" or "planning", but it clearly means "deception", "scheming", "trickery", "guile". Does God Lie? (No. Titus 1:2 is clear: "God, who cannot lie") God allows Satan and humans to do the lie and sins, resulting in decieving people, but God does not do the sin or lie Himself, whereas those 3 verses in the Qur'an (above) seem to say that Allah actually does the lie and sin. Why I do not say, "God did not cause the Calamity, but He can use it for Good". Here are a few that are very important to study carefully. So, ask your Muslim friend, “Do you believe that Al Masih was sinless?” ( Quran 19:19) Was Al Masih born of a virgin? (3:45-47; 19:19-21) They must answer: “yes”. He had no human father. (Emphasize this again; see my earlier article on explaining to Muslims how Jesus is the Son of God. Then ask, “So why did Allah substitute an innocent ram (sheep or lamb) to be killed instead of Abrahim’s son? Let them struggle with coming up with the answer. 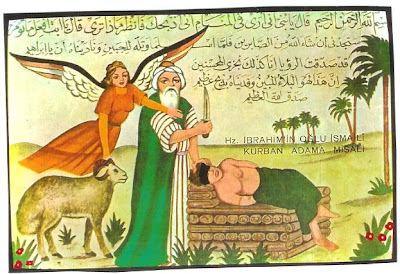 Muslims celebrate the "feast of sacrifice" ( Eid Al Azha عید الاضحی or Eid e qorban عید قربان) by remembering the event of God commanding Abraham to sacrifice his son. They slaughter sheep, goats, bulls, lambs, cows, and sometimes even a camel. Millions of Muslims, over a billion people take part in this slaughtering all over the Muslim world in this re-enactment of the concept of substitution, yet they are taught that it means nothing; just go through the motions, read the verses from the Qur'an, slaughter the animal, and give the meat to the poor. They remain ignorant of this great truth and are told a great lie, that Jesus did not die on the cross. (Surah 4:157) Dr. White calls this one verse, "40 lonely Arabic words", because it is the only place in the Qur'an that denies the death/crucifixion of Jesus and no commentary is on this verse in the Hadith collections. Muslims popularly "feel" they are doing something for God in this; even though they are taught doctrinally that there is no significance to atonement / ransom/ sacrifice in the ritual. They "feel" that doing this sacrifice will protect them from evil or tragedies. Where do they get that idea? Is there somehow a sense of "appeasing the wrath of God" in their minds and hearts? I will never forget seeing the sheep lined up ready for slaughter and bleeting, "baaaaa baaaa". The sheep is blindfolded and some words are spoken; prayers, readings, "bismillah Al Rahman Al Rahim" ("In the name of Allah, the most compassionate, the most merciful") "Allah O Akbar!" A large knife comes out and the cutting begins. The animals writhes in pain and struggles to get free. The men hold him down. The pain is terrible. Blood squirts, tendons snap; bones crunch and then that last breathe goes out of the animal. When I saw that feast of sacrifice for the first time in Turkey in 1987; Genesis 22, Exodus 12, the book of Leviticus and Isaiah 53 came alive for me like never before! The violence of the slaughter is a picture of the wrath of God against sin. My hair on the back of my neck stood up and I almost threw up from the smells and violence of the thing. When we say "the blood of Jesus cleanses us from sin"; it means the violence of shedding the blood; the fact that an innocent, sinless victim became our substitute and took our place. It is a picture of God's justice against sin.